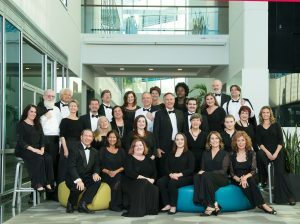 Choral Artists of Sarasota, the region’s premier professional vocal ensemble, celebrates the excellence of choral music through innovative, stimulating performances and educational outreach. Welcome to Choral Artists of Sarasota’s Season of Celebration! This is a very special season for us. Forty years ago, Arden Fowler along with Ann Stephenson-Moe and George Bledsoe created the Southeast’s first professional choir, Gloria Musicae. We announced a new name in the spring 2017 to better reflect our mission and credit our outstanding singers – the Choral Artists – and our home in the cultural center of southwest Florida – Sarasota. We have more cause to celebrate as ten years ago, Maestro Joseph Holt was recruited from Washington, DC as Artistic Director. Under Dr. Holt’s leadership, the ensemble has grown artistically, successfully presenting increasingly challenging programming from across the choral music repertoire. The group has commissioned works, travelled to Europe, and partnered with leading cultural organizations in Southwest Florida: the Sarasota Orchestra, West Coast Black Theatre Troupe, Sarasota Contemporary Dance, State College of Florida, The Master Chorale of Tampa Bay, and Sarasota Young Voices. 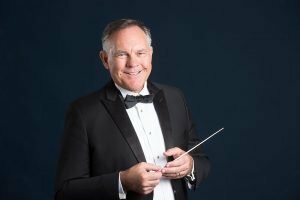 A highlight of the season will be performing with the Sarasota Orchestra and Key Chorale for “Peace and Joy,” Anu Tali’s final concert as music director of the Sarasota Orchestra. A Mother’s Day concert presented by Artist Series Concerts is becoming a tradition alongside our annual July 4th concert. This year, the July 4th concert moves to the Sarasota Opera House – where we pull out the stops with a brass band (thanks to the Sarasota Concert Band) and a Florida premiere of Jerry Bilik’s “Independence” along with patriotic anthems and a salute to the armed services. Even as we rehearse and present the 2018-2019 season we are looking ahead to the 2019-2020 season. We are thrilled to participate in commissioning composer James Grant’s “Listen to the Earth.” This exciting work celebrating our home, the Earth, is created around a libretto which includes writings of astronauts as they circled our planet, and will be accompanied by an inspiring video. Choral Artists will premiere “Listen to the Earth” in April 2020 at the Sarasota Opera House to mark the 50th anniversary of Earth Day. Thank you for celebrating this milestone year with us. We will continue to repay your support with the very best choral music performances – from new works to beloved classics – that we hope will move, inspire and delight you!